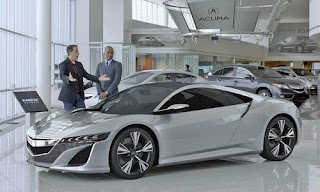 The Acura Super Bowl 2012 commercial comedian stars comedian Jerry Seinfeld and has been released as extended version now. As reported the Acura Super Bowl 2012 Ad marks the first ever Super Bowl Ad for Honda's luxury brand Acura. Jerry Seinfeld tries everything to be the first owner of the 2015 Acura NSX. Acura unveiled the new NSX concept car at the NAIAS 2012 to much fanfare. Acura has just published an extended version of the Acura Super Bowl ad with Jerry Seinfeld. The Acura spot does not disappoint. Jay Leno also makes an appearance. Watch the 2 minute Acura Super Bowl 2012 Ad now below. As reported the second Honda Super Bowl 2012 Ad will promote the Honda CR-V. That commercial is also must see Super Bowl 2012 Ad as it stars Matthew Broderick as Ferris Bueller.